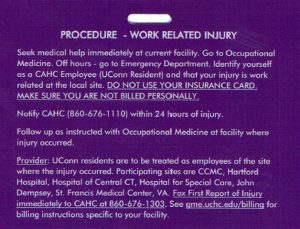 University of Connecticut School of Medicine residents and fellows who sustain work related injuries should be treated at the location in which the injury occurred as if they were an employee of that location. There are specific handling instructions for each location that needs to be followed. All residents and fellows should seek immediate medical attention from Employee Health at the facility of injury. When care cannot be obtained from Employee Health, residents and fellows should proceed to the Emergency Department. 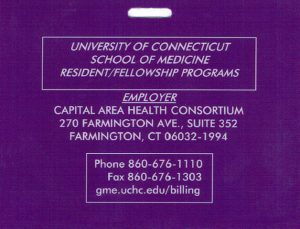 All residents and fellows should present their UConn School of Medicine/CAHC purple card (see sample below) confirming they are a resident or fellow in a UConn School of Medicine sponsored GME program. Notify CAHC at 860-676-1110 within 24 hours of injury. If after hours, leave a voice message with your contact information and date of injury. Follow up as instructed with Employee Health at the hospital where the injury occurred. Practitioner/Medical Provider - Complete form and fax within 24 hours. Use this form to allow resident/fellow to seek treatment outside your facility.